Pi Day! What did you do to celebrate? Today is Pi Day. You probably think I would celebrate by making a pie of some sort.. well not this year… I did celebrate by teaching my kids a bit more of about what Pi is and what it actually looks like. 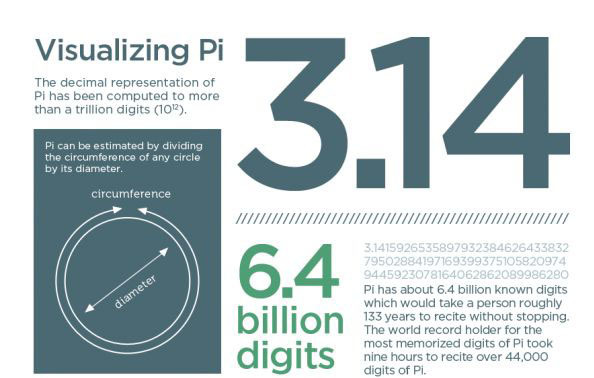 The infographic below does a great job in illustrating all sorts of “cool” things about Pi. If you are looking for some activities to do with your kids in or outside the classroom there is a nice collection of activities here. Please share what you are doing or have done!